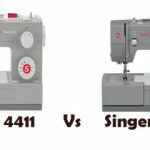 Honest and impartial comparison of two similar sewing & embroidery machines from Singer, the Singer XL-400 and XL-550. There is a huge difference in features between the two. 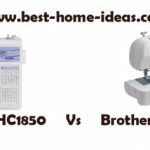 Both Singer XL-400 and XL-550 are sewing and embroidery combo machines. But there is a huge price difference in dollars between the two machines. With XL-400 being the cheaper machine. The difference in price may change according to the shopping season, but still I don’t expect the price difference to go down sharply. In some online stores, these two machines are listed side by side, so a cross comparison is always handy. You can see some changes in the design and features when you compare them. So, all we want to know is whether it is really worth spending extra bucks on Singer XL-550 or not. First of all, we will talk about the sections where these two machines differ. After that we will have a look at all other features. Embroidery Fonts : Singer XL-550 wins hands down here. It comes with 20 embroidery fonts for monogramming. You can even resize, rotate and shape with 30 lettering frames such as arc, banner, wave and more. Even though you can do the same on XL-400, there are only 5 fonts available. XL-550 also has multilingual alphabet support in 9 languages, which is absent on XL-400. 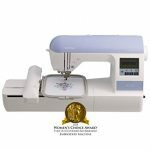 Built-in Sewing Stitches : The throat space of both the machines are same and it comes to 8.25″. It is the number of built-in stitches where there is a day and night kind of difference. 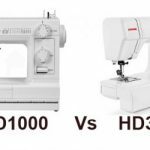 XL-400 has only 30 built-in stitches which include 6 essential stitches, 12 decorative stitches and 2 one-step buttonholes. XL-550 on the other hand has 215 built-in stitches which include 10 essential stitches, 6 stretch stitches, 192 decorative stitches, 6 one-step buttonholes and 1 endless buttonhole. You know who the winner is. Automatic Thread Cutter : XL-550 has an automatic thread cutter which is absent on XL-400. LCD Screen : On both machines, you require a PC or laptop for advance editing. But there is an LCD screen on XL-550 for basic stitch selection, which is absent on XL-400. It doesn’t make a huge difference to be honest. Included Software : AutoPunch, HyperFont & Advanced Editing Software come included with XL-550. XL-400 only comes with a pretty basic digitizing software, which is not really a great software for advanced editing and customization. The autopunch software costs around $200 if bought separately. Now let us have a look at all the features of both machines. The areas of differences are marked out in red color. As far as the performance of these two machines are concerned, there is very little to choose between the two. You can say that XL-550 is better suited for the advanced stuffs as it is better equipped. 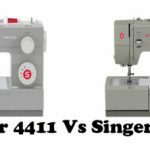 If it is a toss up between Singer XL-400 and XL-550, you will be better of going with XL-550. Yes, I understand that there is a lot of price difference , but when you consider the individual prices of the extra softwares and the sheer variety of stitches and extra features that you get on XL-550, it is definitely worth the money. When you take those things into account, XL-550 seems to be a better deal than XL-400. This doesn’t mean that XL-400 is an inferior machine. It performs equally well, just that those small, little extra features on XL-550 make a difference in the overall user experience. The price is the ultimate deciding factor here.